Long before the iPhone, I worked with Siri! I have a new Twitter follower from a past life. One of my first projects as a just-out-of-college A/V producer in Boston was to create a series of 6-8 hour audio training programs for the American Management Associations. Things got off to a very slow start. My voice over talent would burn out during the long sessions and make time consuming mistakes. Gene Jones, my sound engineer at TR Productions, made a suggestion, "Why not bring in Sue Bennett, she'll do it in one take." Sure enough, Sue was an amazing voice over talent who cranked though the long scripts without missing a beat. That was forever ago. 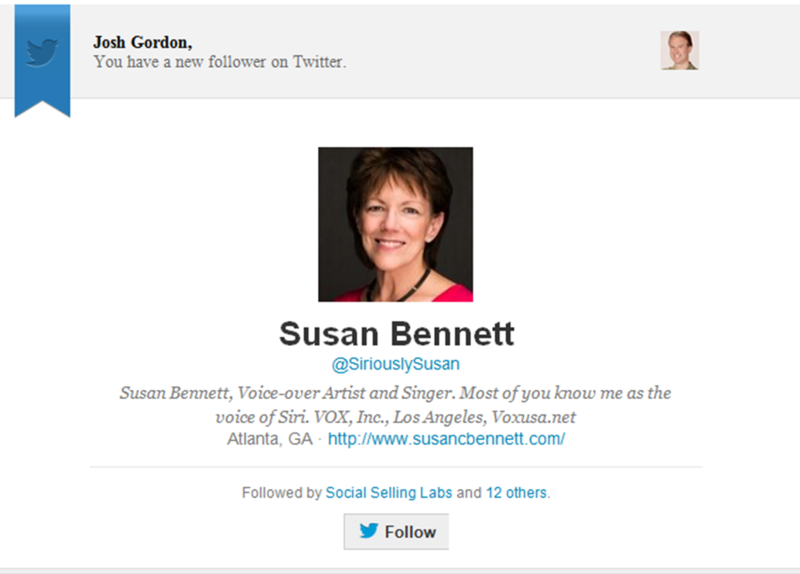 So I was more than a little curious when one "Susan Bennett, Voice Over Artist" started following me on Twitter. It turns out, she was an amazing voice over talent then, and her career never slowed down. Today she is best known as the voice of Siri, on the Apple iPhone.